These kinds of stories are the ‘make or break’ variety, the likes of which are relished by risk-taking small cap stock investors. Come late-September, today’s ASX listed gas micro-cap has a highly leveraged drilling event to look forward to. It’s deftly snapped up a 20% earn in potential exposure to the Tulainyo Project – which has a potential in ground value of up to US$6 billion. That’s a net potential prize of $1.2 billion to this tiny company. The Tulainyo Project has been independently appraised to host up to 6 TCF of recoverable gas – this is giant scale – and untested. Drilling in 2014 at the project encountered multiple, stacked, gas bearing conventional reservoirs... however they were not tested due to mechanical difficulties. Based on all work completed to date, the company is reckoning on a 50/50 shot at success. Which we think are pretty good odds given the size of the prize. But it may not suit your investment strategy or risk profile – so if you are chasing a safe, slow yielding ASX200 stocks – stop reading now or seek professional financial advice before making an investment decision. 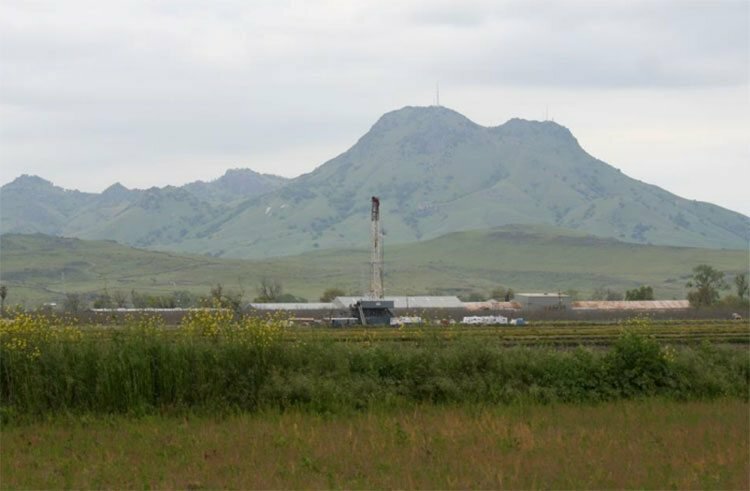 This potentially monolithic conventional gas resource sits in northern California’s prolific Sacramento Gas Basin. 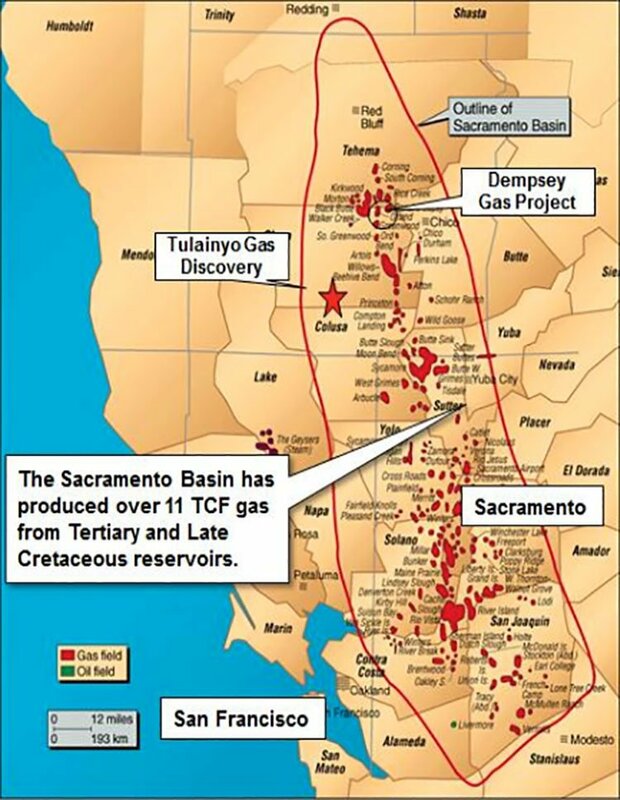 The Sacramento Basin has been a significant gas-producing province for decades, and more than 11 trillion cubic feet of gas has been tapped from its fields over the years. The structure of the gas discovery is a large anticline with up to 91 square kilometers of closure. Here, there is a strong surface expression, gas seeps and gas encountered by historic drilling. Historic drilling suggests that the entire anticline could be gas charged. The structure is said to closely resemble a major discovery in Wyoming whose gas reserves have been estimated at up to 40 trillion cubic feet. With its eye on a gross, unrisked multi tcf prize, today’s ASX gas junior is hoping to encounter something very sizeable when it commences an appraisal well in late September. That’s right – this is an appraisal well – the discovery has been made. Lending serious credibility points to the venture, is the company’s pair of strategic, high-pedigree partnerships. The goal is to leverage its outcomes by working in a joint venture capacity with its farm-in partners. One of these is none other than California’s largest natural gas producer: California Resources Corporation (NYSE: CRC). Not bad for a microcap ASX stock to have a company like this on its side. The other is Cirque Resources LP, a private company based in Denver, Colorado, which is captained by well-known oil and gas explorer, Peter Dea. Highly leveraged appraisal drilling is set for September, merely a few short weeks away. This project would therefore be prime for commercial development, with just moderate onshore-California development costs. But if drilling is unsuccessful... Well, that’s it. No cigar. We hasten to note again that this isn’t for the faint of heart. Magnum Gas and Power (ASX: MPE) is a humble ASX energy explorer, powering towards exploration of its potentially high-impact project. At the core of MPE’s strategy and business plan is a razor-sharp sense of focus and a no-holds-barred, approach to its newly acquired Tulainyo Gas Discovery project in California’s Sacramento Gas Basin. a major gas trunkline is sitting just 8km away from the discovery. MPE is homing in on this one, high-impact target with steely resolve and unwavering attention. With a market cap of just $8.9 million and the potential to significantly disrupt the supply-demand dynamics of California’s natural gas industry, this tiny stock could be an excellent entry point into the oil and gas market. California is one of the world’s most prolific oil and natural gas producing regions. Yet, as the United States’ largest state economy and the eighth largest in the world, it has significant energy demands that currently exceed local supply. Of the state’s 2.5 Tcf per year gas demand, California only produces one sixth. That means more than 90% is imported from out of state, and by 2025 natural gas imports are expected to make up 98% of usage. With extremely high demand for in-state gas production, MPE may well be in exactly the right place, at the right time. If it can manage to discover a giant gas resource in the Sacramento Basin, it could sell it for vast sums of cash. Of course – success is no guarantee here – investors should exercise caution when investing in a stock like this. It will also be looking to follow in the footsteps of other highly speculative gas plays that have made their mark in the region including Golden State Resources which spudded its first well on the Golden Eagle Oil & Gas Prospect in Grand County, Utah. The 14,500 foot well targeted 11 potential pay zones within the Golden Eagle structure, which exhibited gas prospects of 3 TCF. GDN owned 80% of the resource (2.4TCF) and it was noted that a minimum case of 50 BCF would be economic. 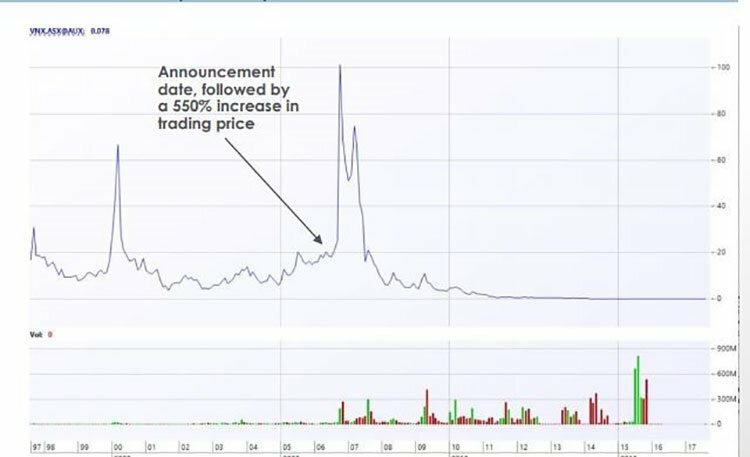 Here’s a look at what happened to GDN when they announced the spud – GDN had a market cap of $30 million on the announcement and indicative market cap at its peak of $164 million. Regular readers would no doubt be well familiar with 88E . 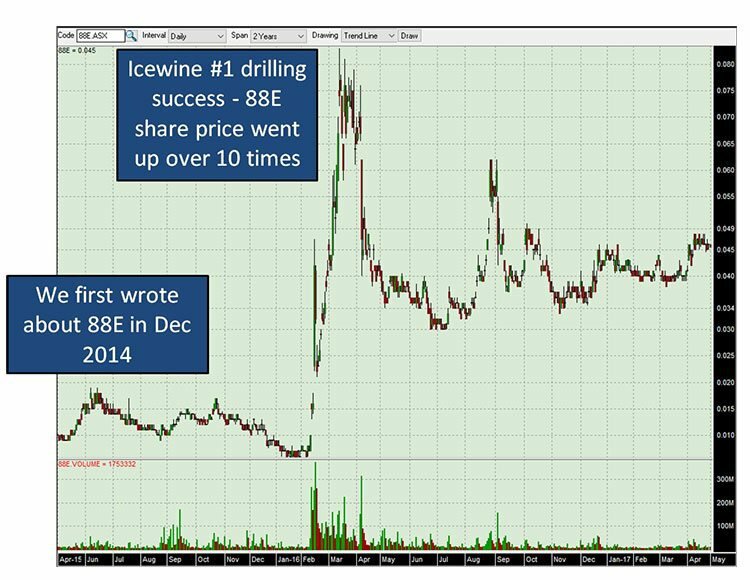 One of our most successful oil and gas stocks here at the Next Oil Rush, 88 Energy (ASX | AIM: 88E)’s confirmation of drilling at Project Icewine in Alaska was similarly well received. At the date of announcement, the oil potential was suggested as 2.1 billion barrels, with additional conventional potential deposits noted immediately proximate to the Icewine site. Suffice to say there is a great deal of upside if MPE can strike large, commercial gas quantities. To cover its share of the drilling costs, MPE has completed a $4 million capital raise , so is well funded in the lead up to this game changing event. As announced on June 5, MPE signed an agreement to invest in appraisal of the Tulainyo Gas Discovery in California’s Sacramento Basin . MPE will do this by earning a 60% interest via a shareholding in Gasfields LLC, which holds the right to acquire up to a 33.33% interest the Tulainyo gas project via staged farm-in (Gasfields LLC is a US-registered subsidiary of Bombora Natural Energy Pty Ltd.). MPE is to provide funding to Gasfields to meet the main costs of the first well in a staged farm-in program that can earn Gasfields up to a 33.33% interest in the project. The Tulainyo farm-in agreement sees the parties holding a 152 square kilometre (close to 40,000 acres) net leasehold position over the large site anticline on the west side of the prolific Sacramento Basin. The joint venture includes the project operator, California Resources Production Corporation and Cirque Resources LP. We touched on it earlier, but we’ll return to the credentials of this powerhouse collaboration in more detail a little later. Northern California’s Sacramento Basin has been a notable gas-producing province for many decades, and more than 11 trillion cubic feet of gas has flowed from its fields. Not far from where MPE has cast its sights is Rio Vista gas field, which has produced over 3.6 trillion cubic feet of gas in its lifetime and is still producing. 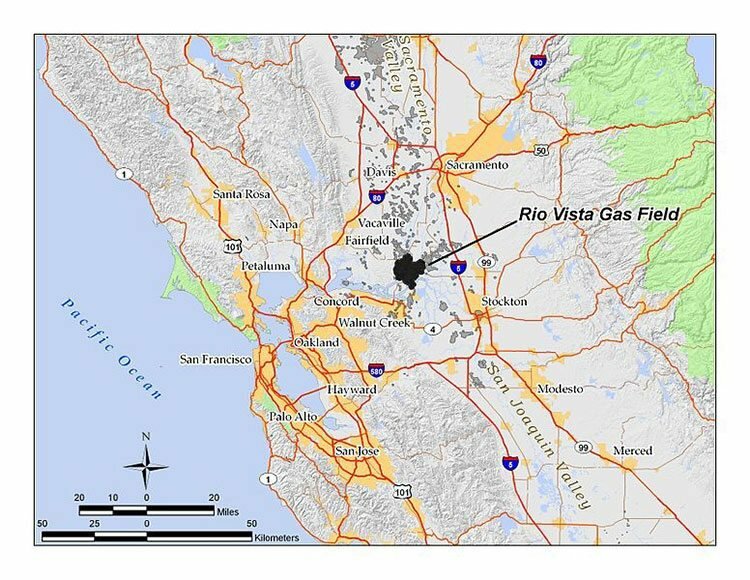 Rio Vista is the largest onshore natural gas field in California and one of the 15 largest fields in the United States. The Sacramento Basin itself is a deep, thick sequence of sedimentary deposits within an elongated northwest-trending basin located in northern California, covering about 12,000 square miles and forming the northern part of California’s Central Valley. It has a considerable history, with exploration starting in 1918. If MPE manages to successfully confirm a commercial flow of gas, the project is ideally situated for future development, with access to gas markets and existing infrastructure, and should see just moderate onshore California development costs. The Tulainyo Gas Discovery structure is a well-defined large anticline similar in size and shape to the 50+ trillion cubic feet Pinedale anticline in Wyoming, with up to 91 square kilometres closure. It has a strong surface expression, gas seeps, and gas has been encountered here during historic drilling. The figure below shows the surface structure of the site’s anticline. Based on the size of anticline and a few thousand feet of potential gas charged section, the project has multi-tcf natural gas potential. As we’ve mentioned, the anticline bears a strong resemblance to the Pinedale anticline, which is one of the largest accumulations of natural gas in the continental United States. Pinedale is currently operated by the 2.06 billion-capped QEP Resources (NYSE: QPE). Not to forget that it is in close proximity to large natural gas pipelines and a supply-starved market. The producing interval at Pinedale is approximately 6,000 feet thick with multiple stacked-sand bodies covering up to 20 acres each. 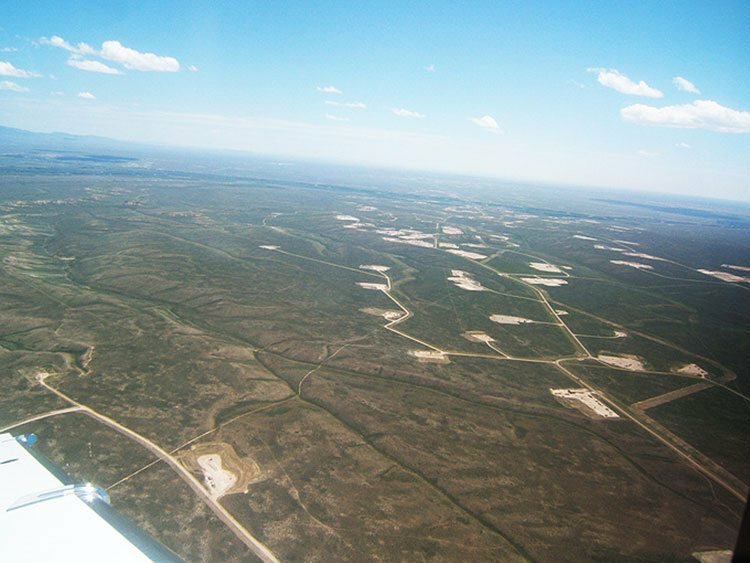 The thick and unique gas-charged section means Pinedale contains more gas per square mile than almost any other gas field in the US. This makes it one of the top producing gas fields in the country even though the producing area is only around 150 square miles. 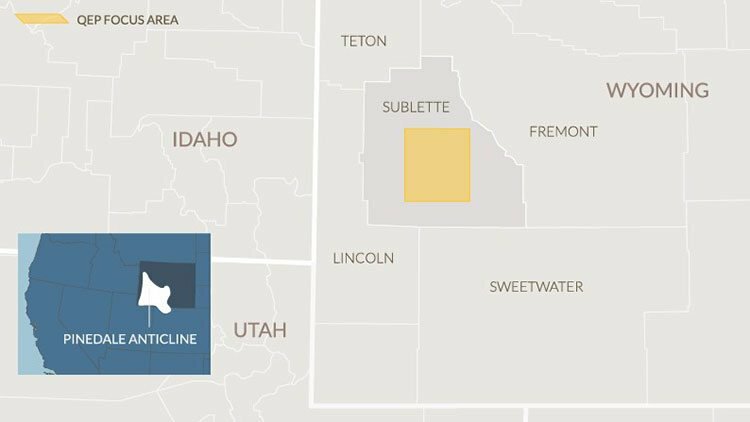 Pinedale’s gas reserves have been estimated at up to 40 trillion cubic feet. That’s enough to service the nation’s entire natural gas demand for 22 months. MPE is hoping to find something similar here in the Sacramento Basin. Given the similarities that have been drawn between the Tulainyo structure and the Pinedale incline, these kinds of numbers suggest at the magnitude of what MPE could unveil if it successfully taps a resource. 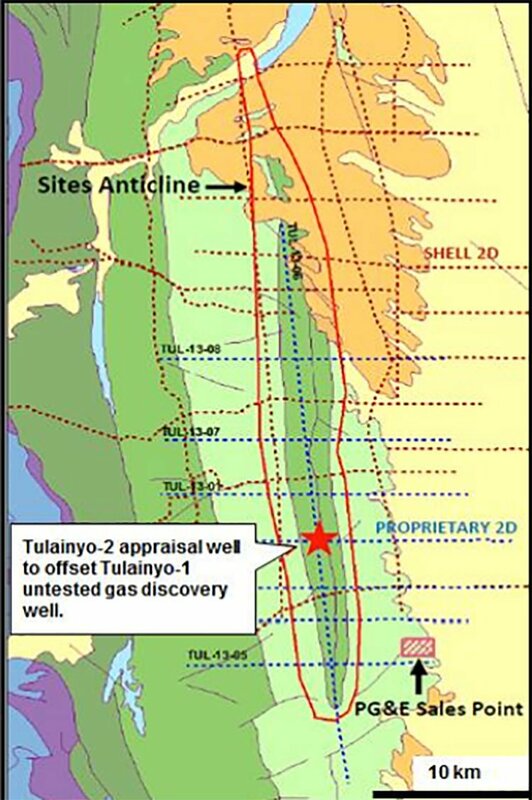 MPE has released the results of an internal assessment of the potential recoverable gas resources for Tulainyo, which are shown in the range below. As you can see, there is potential for MPE to discover a resource of some 507 billion cubic feet. High gas shows of 1,000 to 5,000 units were recorded against elevated mud weights. The sands could not be tested due to mechanical difficulties. Yet historic drilling, including the most recent well, indicates that the entire anticline could be gas charged. To assess the commercial gas potential here, the joint venture is planning the Tulainyo-2 ‘proof of concept’ appraisal well, to be funded by Gasfields. Drilling is due to commence next month, around late-September. This could be a defining moment for MPE and could have us tracking this company very closely over the coming months. Under the terms of the farm-in agreement, Gasfields will earn a 10% interest in the southern half of the very large, 152 square kilometre leased land position by Tulainyo-2. If it decides to drill a second, deeper well in the area, Gasfields’ interest will increase to 33.33%. Gasfields would also have the option to drill a third well in the northern half of the land position to earn up to 33.33% in the entire leased area. Under the farm-in, the committed cost exposure of Gasfields to the earning phase of each well in the earning drilling program will be capped, based on joint venture agreed estimates. 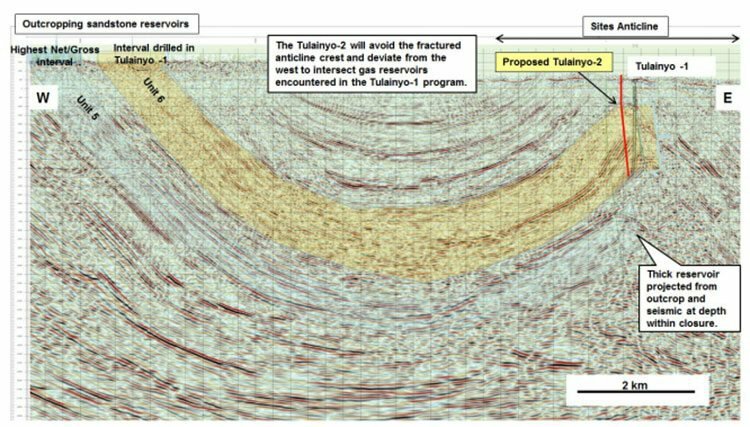 Drilling Tulainyo-2 will evaluate and flow test the gas sands penetrated at depths less than 1,700 metres by the Tulainyo-1 discovery. Gasfields parent, Bombora, has worked closely with the joint venture to prepare a robust well plan for Tulainyo-2, incorporating tried and tested industry techniques and expertise from similar over-pressured, gassy operating environments. In the following figure, you can see the regional west-eastern dip seismic line from outcrop across the Tulainyo Gas Discovery structure. Prospective recoverable resource estimates have been calculated for Gasfields’ net interest in the project. MPE’s potential net gas resource ownership is also net lease ownership percentages and applicable royalties. The net figures shown in the table below derive from unrisked gross prospective resources, ranging in excess of 600 billion cubic feet, 2.1 trillion cubic feet, 3.1 trillion cubic feet, and 6.3 trillion cubic feet for P90, P50, Mean and P10 recoverable resource categories respectively. MPE has found itself in a prime location. Intriguingly, the area that will be drilled here is largely underexplored. This potentially giant-scale conventional gas resource is also ideally situated, located onshore near extensive gas infrastructure. Also very much in MPE’s favour is the fact that the project is operated by one of the premier oil and gas exploration and production companies in California: California Resources Corp.
MPE has forged some highly advantageous partnerships in taking on the Tulainyo discovery, and these strong networks also do considerable work in balancing risk. As we touched on earlier, the first of these is California Resources Corp, California’s largest oil and gas producer on a gross-operated basis. It is also the largest privately held resource acreage holder in California, with approximately 2.3 million net acres spanning the state’s four major oil and gas basins. These are some powerful hands that are linking up with MPE’s. To illustrate the kind of proactive force California Resources Corp is capable of, the company supplied nearly four billion gallons of treated, reclaimed water for California agriculture in 2016 — a 50% increase from 2015. Impressively, in 2015, California Resources Corp also produced 44 million cubic feet of natural gas (or 7,000 barrels of oil equivalent per day) in the Sacramento Basin, which could supply all the homes in the City of Sacramento for nearly two years. It has a sizable inventory of over 30,900 gross drilling locations and 6,400 gross prospective resource drilling locations throughout the state, as well as a significant portfolio of conventional and unconventional opportunities from which it plans to generate production growth over the longer term. It’s backed by a team with extensive domestic and international oil and gas experience, and has approximately 60 employees and contractors at its sites in the Sacramento Basin. In short: a very useful heavyweight player and considerable leverage for MPE to have on its team. Dea’s CV is a formidable one, showcasing 29 years of oil and gas exploration and production experience and involvement in state and national energy policies. 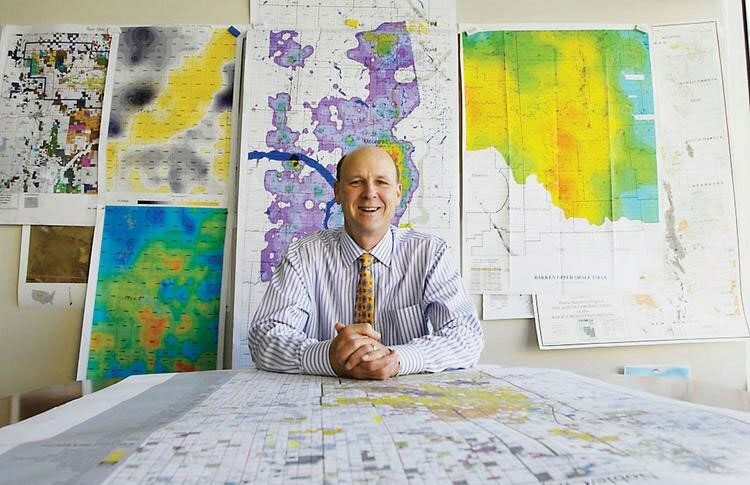 Formerly CEO of Western Gas Resources Co. and Barrett Resources Corp., Dea was named ‘Wildcatter of the Year’ in 2010 by the Independent Petroleum Association of Mountain States, inducted into the Rocky Mountain Oil and Gas Hall of Fame in 2009, and made an ‘All-American Wildcatter’ in 2014. The takeaway? Dea is someone you definitely want in your oil and gas corner. California is the nation’s largest state economy and the world’s eighth largest, with hefty energy demands that exceed local supply. California might be more widely known for its innovative tech industry than its oil repository, but it’s one of the most prolific oil and natural gas producing regions in the world. It’s the third-largest oil producing state in the US, and has the largest oil producing US county outside Alaska. 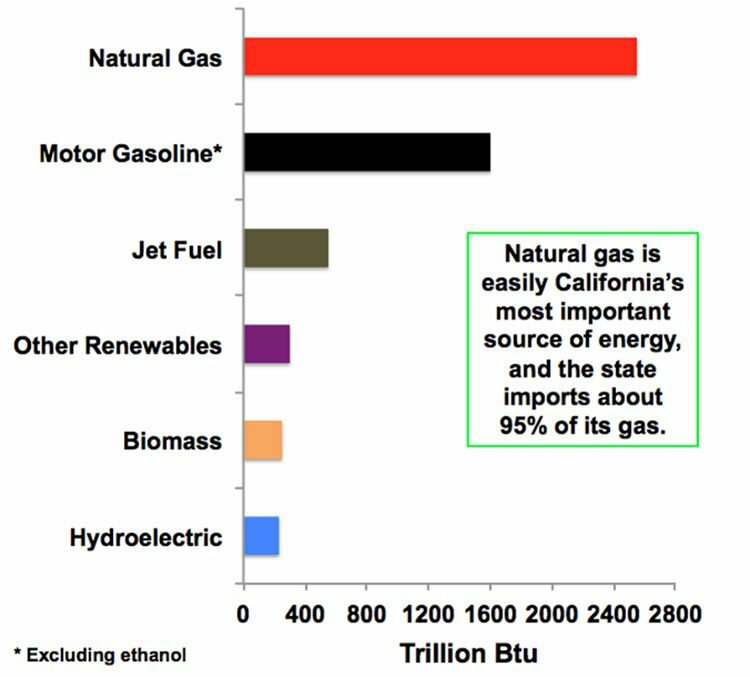 However aside from oil, California demands approximately seven billion cubic feet of gas per day, with local California gas production contributing less than 10%. The majority of its gas usage is imported from foreign countries. 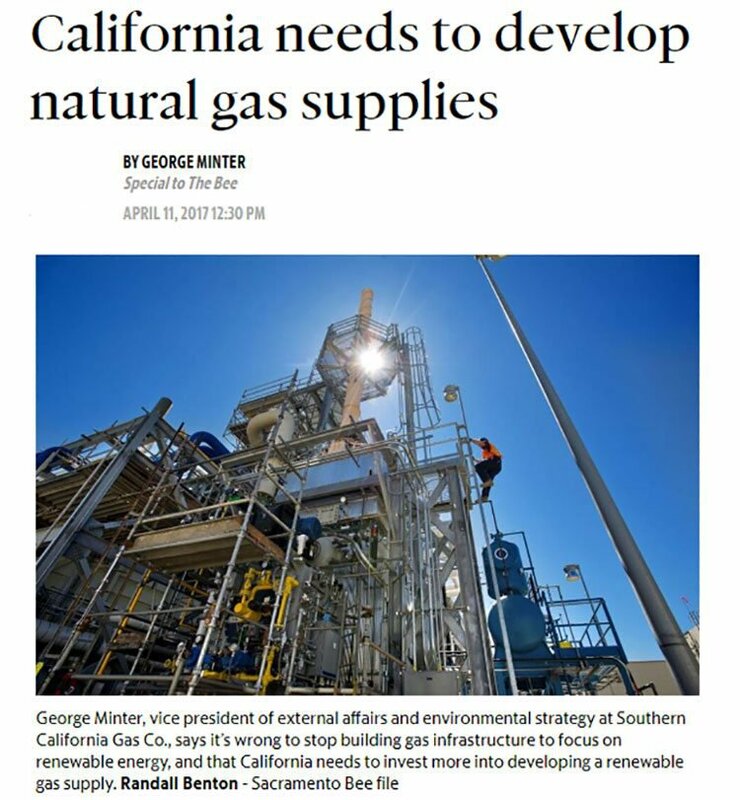 The following article highlights the importance of natural gas infrastructure in California, at a time when focus is swinging to low emission energy sources. What does this supply-demand discordance mean for MPE? If it can eventually reach gas production stage at the Sacramento Basin, MPE could be in very hot demand and in a position to command premium market prices. With a sound string of solid partnerships, its prime location in the Sacramento Basin, and a steely-eyed focus, MPE is in a very strong position to make good with its ‘proof of concept’ appraisal well planned for the coming weeks. If all goes as planned it could be a highly lucrative move for this undeniably ambitious company. Yet again, this is a highly speculative, high-risk stock and investors should seek professional financial advice before making an investment decision. Here’s a look at its project development timetable. As you can see, it is looking to move quickly. It’s early days yet, and MPE is capped at a tiny $5.54 million, making this an excellent entry point for the small cap oil and gas investors. We’ll be sure to keep our eyes firmly fixed on this aspirational gas junior in the coming months.